Glaciers are not usually associated with islands in the South Pacific. But thanks to high mountains and abundant snowfall, over 1,000 square kilometres of New Zealand lie buried beneath slow-moving masses of ice. Almost all are in the spectacular Southern Alps. 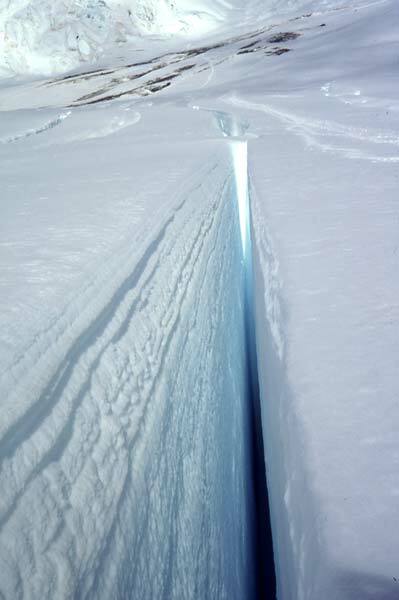 A glacier is a huge mass of moving ice that has formed from fallen snow. It slowly moves down a slope. When it gets to where the air is warmer, the lower end melts. As fresh snow falls higher up, the glacier keeps forming. The earth has had many ice ages, lasting thousands of years. Glaciers expanded, covering large areas. In New Zealand they created the magnificent scenery in the South Island, including valleys, fiords and hundreds of lakes. Between ice ages, as we are now, the glaciers usually shrink. Rock and shingle have replaced the ice on slopes around Aoraki/Mt Cook. Some glaciers are melting more than they are gaining from snowfall. This boosts the water in rivers used for hydroelectricity and irrigation. Although it is a Pacific country, New Zealand has over 3,100 glaciers. Almost all are in the central Southern Alps, where there is heavy snowfall. More than 40% of Aoraki/Mt Cook National Park is buried under glaciers. In the North Island, only Mt Ruapehu has glaciers. Tasman Glacier, in Aoraki/Mt Cook National Park, is New Zealand’s largest and longest glacier: 600 metres thick and 29 kilometres long. It receives up to 20 metres of snow each year. 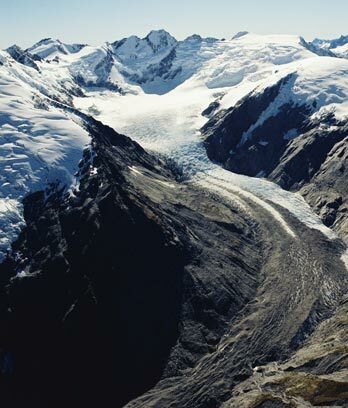 The Franz Josef and Fox glaciers are in Westland Tai Poutini National Park. They are unusual because they reach the rainforest on the West Coast. At Franz Josef, cascades of white ice are framed by green trees and ferns. Visitors to the glaciers enjoy heli-skiing, scenic flights, guided walks and mountaineering.